Altered Instinct: Matt Hardy talks Cadavers. The comic, not the actual bodies. Matt Hardy talks Cadavers. The comic, not the actual bodies. Matt Hardy is the evil cackling genius behind Mad Robot Comics. Well, one of the evil cackling geniuses (genii?) alongside Edward Bentley. He's been in these parts before, but he stops by as the team is midway through its latest Kickstarter, for the Cadavers series. Welcome back, Matt! For those who haven't caught your previous visits, a quick recap – you're one of the founders of Mad Robot Comics and busily starting to make a presence thanks to your Madhouse comic and now, you're midway through a Kickstarter for your new project Cadavers. Tell us a bit about the new project. 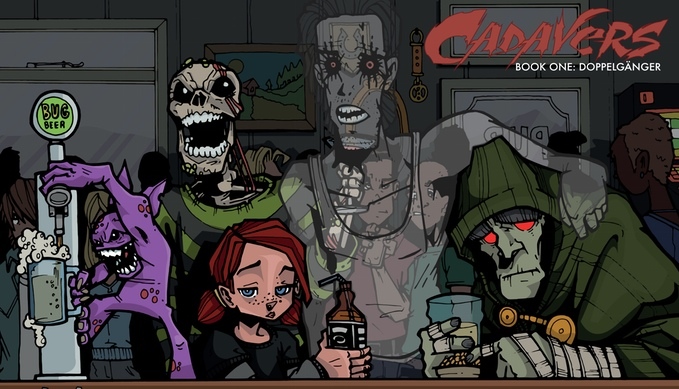 Cadavers is a 5 part series - each issue focusing on one of the 5 main characters - these are outcasts, misfits…. but like the best comic-books these outsiders have superpowers. Mystical cool superpowers. Our first issue, Cadavers: Doppelgänger, concentrates on the attempt by the Cadavers to hunt down and confront Marckus North - the head of the media empire that exploits the public's fear of the Cadavers for profit and power. I know I keep re-using the tag line Smokin’ Aces (the film) meets X-Men (the comic - not the film) - but it does the trick and kinda sums up what we are aiming for. So you've hit full funding on Cadavers and are into the stretch goals – what kind of bonuses can people investing see? Well I blinked and we smashed the first stretch goal - a copy of the Mad Robot Comics Digital Sketchbook - all the short stories and concept art we have produced over the years in one handy place. Some amazing stuff and some stuff that I hoped would never see the light of day….. Stretch Goal 2 is when we reach £3,000 - it’s a special 3-page introductory Cadavers tale staring Bogeyman that we will release digitally to ALL backers. Stretch Goal 3 is for £3,500 so we can include the extra 3-page story in the physical edition of Cadavers 1: Doppelgänger (adding extra pages at no extra cost). I think the main Kickstarter rewards that are getting the attention this time fall into 2 categories. Firstly the personal stuff - a chance to appear in the comic or the chance to design a monster for one of our spin-off comics. Secondly the money can’t buy stuff - Edward’s original art, his postcard sketches, the Trading Cards and a Pop! Vinyl version of the first issues’s focal character -Doppelgänger - not available in any shop! 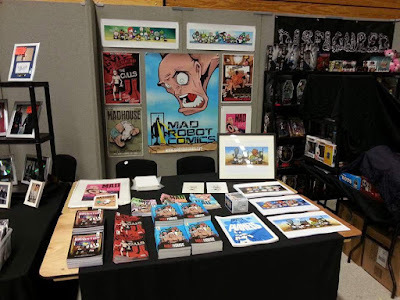 Mad Robot is broadening its scope, I understand, and featuring new titles by new writer and artist teams rather than just you and Edward Bentley now, is that right? Who's coming aboard and how many new titles are there? Well Cadavers is our main focus, but we have several other projects in development. Edward has decided that he can do a much better job than me and so is both writing and drawing his own solo project ‘Skate or Die’ - considering I can’t draw I have to agree with him. We also have a 50 page One-Shot/Graphic Novel called ‘Murder Most Mundane’ and a planned 5 issue series called ‘Night Terrors’. Did the creators come to you or did you approach them? How did that come about? As I’m sure you know, there are just too many stories you want to tell and never enough time to tell them, so I roped in some help. ‘Night Terrors’ came from an idea Ed and I were knocking around about little kids fighting back against the monster under the bed. I roped in a script-writer I knew called Jordan Thomas and we put together this Stephen King/gang of kids rescuing their friend from an otherworldly monster story. Yeah I kicked over some furniture when ‘Stranger Things’ came out - but although the themes are the same our story is thankfully different. Jordan took our concept and created an amazing world of fully fleshed out characters that everyone should recognise and relate to. I knew an artist from a few years back - Dan Earey - he is amazingly talented, his work is simply stunning - he is fairly new to comic stuff - but wanting to break in, to learn. He knocked the ‘Night Terrors’ character designs out of the park so all 3 of us are currently working on putting a first issue together. For ‘Murder Most Mundane’, the co-writer, Ash Deadman, came to me. I loved his pitch of explaining why so many small villages (in programmes like ‘Midsummer Murders’ and ‘Miss Marple’) have such a high murder rate - and yet no-one seems to notice! I helped Ash develop the concept into a graphic novel plot and I’m sharing scripting duties. Ash brought with him Clark Bint as an artist - Clark’s work is subtle, detailed and eerie - his character work and story telling instincts are spot on as well - so perfect for the story and the book is going to look amazing. I've really enjoyed Madhouse – will there be a return to that world at some point? Or is that adventure done? The previous Kickstarter obviously went well – but in terms of response to the finished product, what kind of feedback and reviews have you received? It felt like dropping down the rabbit hole… and then dropping down it again…. and then again - that was one of my favourite quotes on ‘Madhouse’. We are never going to say no to a Lewis Carroll comparison. People feeling that it was more like a novel than a comic (I’m still musing over that one), some people saying they felt a little confused (I’m happy with that - that was part of the plan) - but even those who felt bamboozled by the ideas and concepts still say they loved the story and adored the art. One of the scenes from Cadavers, the latest project. Who's your favourite character from the new Cadavers team? What's your convention schedule? Where can we expect to see the Cadavers popping up? Myself, artist Edward Bentley and our web designer Dan Gruitt will be manning the MRC stand at the Bournemouth Film and Comic Con on the 3rd and 4th September 2016, and we’ll be at the Eastbourne Wynter Con on the 1st and 2nd October 2016. The Mad Robot Comics team on tour, with a table full of material at convention. Looking back on the past year, you've developed a range of characters and titles now – what's been the most satisfying thing to come out of that process? Of course I’m delighted with the response Cadavers has received. The Kickstarter is running away from us and people are loving the concept and the art. It’s getting the response we hoped for and very much putting us on the map. But from a personal point of view, just having the opportunity to work with other creators - help develop their ideas - they’ve been some of the most rewarding experiences of the last year. And after this, what next? What's your plan? Sleep. Lots of it. Kickstarters are exhausting. Absolutely exhausting. So maybe two or three hours sleep and then onto the next thing. I believe I have a sci-fi spaceship pitch coming my way from one of the Inklings Press guys. I have a very different taste in comics to this guy, but we both love The Legion of Superheroes - so he gets the benefit of the doubt based solely on that. And then it’s onto the Cadavers major motion picture. Aim big they tell me! Thanks, Matt, and looking forward to your next visit to the blog! You can chip in to the Cadavers Kickstarter here. The Mad Robot Comics team is also on Twitter here.